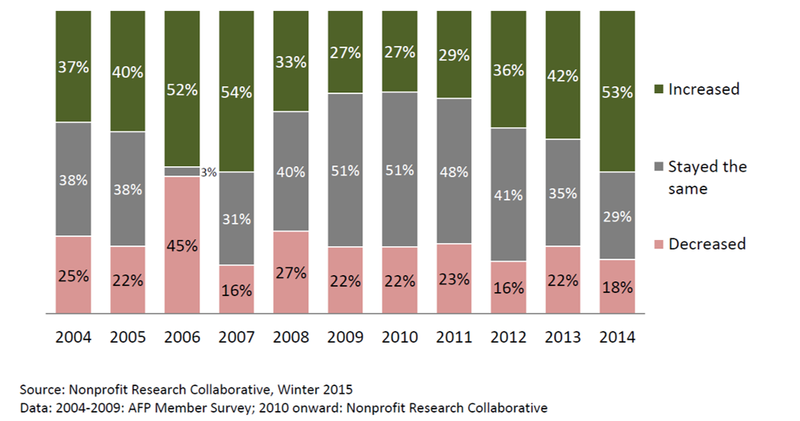 The following graphs summarize fundraising results at hundreds of charitable organizations each year, surveyed first by AFP (2004-2009) and then by the Nonprofit Research Collaborative, which PPP joined in 2011. The individual organizations submitting data change from year to year, and it isn’t a “representative” sample of the charitable sector. But it does give an interesting glimpse of the planned gift pipeline that kept on producing, even when overall giving declined. Throughout the recession, gifts committed years earlier continued to mature. We know that many organizations reduced their gift planning programs between 2008 and 2011 while others wisely increased these efforts. When the next recession arrives, what will happen to organizations that have not been adequately and consistently feeding their pipeline? How might a charity ‘recession-proof’ its development program so that contributions continue to materialize, even when times are tough? We asked two experts who work with a wide variety of organizations. Robert Sharpe of The Sharpe Group argues for the importance of bequests relative to other giving instruments in the face of financial uncertainty. According to IRS and other reports, during the recession, major and outright gifts dropped off by 60% to 70% in some cases. This does not mean that overall giving dropped off. For many donors, deferred gifts offered mental and financial security at an uncertain time. Charities that encouraged deferred gifts continued to add commitments to the pipeline that may pay off in the next recession. Robert also notes that economic downturns affect various age groups disproportionately. Older donors—those in the 70 and older age group—will not be as affected by job loss since most individuals in that segment no longer work. Similarly, falling stock and asset evaluations will have slighter effects on people who have invested over a long time horizon and have already accumulated a large amount of wealth over their lifetime and no longer participate in revenue building. Bequest commitments from this group also have a much shorter pipeline between commitment and maturity. To encourage new commitments, the way organizations’ count them is important. Brian Sagrestano of Gift Planning Development, LLC, points out that donors are more likely to give when they know that their gift will count towards something. When an organization sets a goal for bequests in a campaign, that option becomes attractive for donors who want to participate, even when faced with an uncertain financial future. Brian also emphasizes that it is crucial to have a robust planned giving program before the next downturn, and keep it consistent through all economic conditions. New relationships can be difficult to make in hard times, so it is important to continuously cultivate donors and move gifts into the pipeline. Doing so will help organizations reliably anticipate income even during a recession. When such a decline does inevitably occur, Robert Sharpe points out that organizations that cut marketing and dedicated planned giving staff to accommodate tighter budgets set themselves up for failure. Short term financial gains achieved by slimming staff and marketing budgets will in many cases lead to much greater losses down the road when fewer bequests have been discovered and there were fewer persons left to steward donors in the pipeline. The wide range of giving options available to donors allows American philanthropy to survive, and possibly even thrive, during the dips. Organizational strategy is important and so is preparation. So long as charities understand the environment around them and work with donors to achieve meaningful, impactful ends, there is every reason to believe the planned gifts are one way to beat the next recession. Joshua Tracey is a Master of Philanthropic Studies candidate at Indiana University’s Lilly Family School of Philanthropy and a graduate assistant for PPP. Josh’s nonprofit career includes work with AmeriCorps and Habitat for Humanity. This summer, he is interning for Independent Sector and Indiana-based Human Energy Initiatives.